Martha Chavez knew that when she heard 1 1/2-year-old niece Victoria Blackie singing the C scale, she would one day be a star. And with numerous awards and high-profile performances, the now 23-year-old American Indian country singer—her mother is Navajo, her father Hispanic—is proving her aunt right. At the end of April, Blackie performed a 45-minute set at The Gathering of Nations, one of the largest powwows in the United States, which takes place annually in Albuquerque, N.M.
“I really wasn’t nervous. I was more excited to perform on such a large stage that brought more than 500 native nations together,” she says. Blackie was born and raised in Salt Lake City. After hearing Blackie sing, Chavez became her vocal coach, and she began performing in public at 3 years old. At 13, she embarked on seven-week tour with a teen pop band in Japan and was later invited to sing at the 2002 Winter Olympics in Salt Lake City. Blackie describes her music as traditional country and compares herself to Patsy Cline and Loretta Lynn. She released her first album, Wanted Man, in 2009. 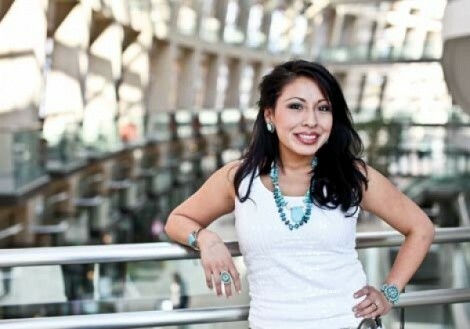 After its release, she was nominated for eight Native American Music Awards in November 2010 and snagged the prize for “Debut Artist of the Year.” She is also the recipient of two Indian Summer Music Awards this year, winning in the Best of Country and Best of Blues categories. And although she didn’t win Outstanding Country Album and Outstanding Album Single at the North American Indigenous Image Awards, held during The Gathering of Nations, she was excited about the nominations. Blackie applied to play at The Gathering of Nations in 2010, but wasn’t chosen. But after taking home numerous awards, the agency that books talent for the event held each April took notice, and she was invited to sing in front of thousands of people. “I enjoyed other people singing along with me. That lets me know they are listening [to my music],” she says. Despite her success in the Native American music scene, Blackie—who typically plays in casinos and at fairs and festivals—says trying to break into the mainstream country scene hasn’t been easy. “I am still trying,” she says. “There are so many gifted people, but if you have something different that people aren’t used to seeing or hearing, you have somewhat of an ‘in,’ ” she says. She believes she has what it takes to sing alongside country’s biggest stars, and she is grateful to have the support of her family, most of whom have musical backgrounds, and her husband, who likes to tag along on tours. She’s motivated to achieve her dream. After working a day job, Blackie meets her aunt at her recording studio and works on her music. She is currently recording her second album, scheduled for release this fall. The album will feature a mix of songs she wrote and remakes of traditional country songs. She regularly rehearses with her band for five hours on Saturdays, but when she has a show coming up, rehearsals are bumped up to three nights a week. She’s preparing for a summer tour and has concerts scheduled in New Mexico, Colorado, Chicago and Nashville, Tenn. Each show, she says, is a learning experience.